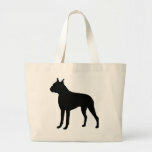 I wanted to make some tote bags for my Zazzle store with different dog breeds on them. 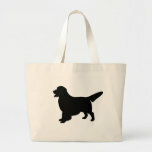 I like silhouettes because they seem to depict the breed in general rather than a photo of one particular dog. I tried making the silhouettes in my Photoshop Elements program, but the edges were fuzzy and had shadows. Even if the finished product looked fine, it was hard to work with. What I wanted was a vector image with clean lines rather than pixels. I have an old version of a drawing program on a disk somewhere in my cupboards but I just didn't have the energy to look for it. I browsed around online to see what might be available for a free program. I had used Adobe Illustrator when I was working in graphics but didn't use it very much. I just wanted something to make simple vector images. I happened to select Inkscape but I many other drawing programs would work similarly. First I selected an image or photo that I wanted to make into a silhouette. I could have tried to draw it freehand, but I'm not that good. I just wanted to trace the image and fill it in with black. 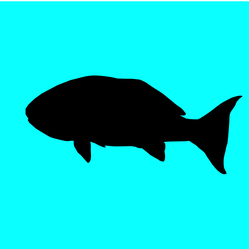 When I opened the Inkscape program, I went to File, Document Properties and selected the size I wanted the silhouette to be. It will ask if you want to embed or link your image. I selected embed. Then go to the File menu again and select Import. Find the image you want to trace and select it. This time I usually select it as a link. I'm not going to keep it anyway so it doesn't really matter. Resize the image by dragging the arrows until it fits neatly into the box that is the document. Zoom the image with the magnifying glass icon until you can see clearly what you are tracing. It doesn't matter if it is blurry. Your drawing will be nice and smooth. The tool between the pencil and the pen on the tool bar is the "draw benzier curves and straight lines" tool. Click on that and then click on the place you want to start your drawing. Move the cursor to the next point and click. You will have a line between the two points. Keep moving around the image and clicking. If you drag the cursor slightly, you will have a curve, but don't overdo it. Go all the way around the image. You can even move the cursor to the sliders to move the image over and go back to drawing. The cursor will still be holding the "thread" of your drawing. When you get all the way around, put the cursor on the first square so that it turns red. Click and the outline will be joined with a black line. Click on the black box in the color samples at the bottom. The drawing should fill with black. Actually, you can pick any color but I am working with black at the moment. Now I look for any sharp bumps that need to be smoothed out. Using the tool right underneath the selection arrow on the left tool bar, click on the outline of the image. Little squares called nodes, some with handles, will appear. The squares can be dragged to where you want them and the handles are the adjustments for how far away your curve will be. It takes a little practice with this to get it right, but before long, you can do amazing things with this tool. You can add curves, delete points, add points, break and connect points using the menu bar. I go back and forth between looking at the whole image and zooming in on spots that need work. When I'm satisfied, I go to Edit and Export as Bitmap if I want a transparent background. Saving as a jpg or as a Cairo png will put it on a white background. If I want to put a colored background behind it, I use the layers and make sure the image is on top. And now you can play with the filters. There's always one I just have to try. It may be a little slow at first to learn how to use nodes and handles if you haven't done it before, but soon you'll be zipping out an image in no time. It just takes a little practice to get the hang of it. I'm not an expert on drawing programs or graphic programs by any means, but I love learning something new and there's plenty to learn here. I'd be happy to hear suggestions or comments from the pros. I love free downloads too, especially when they are really good ones! Well, I did use Illustrator which has nodes and handles too so I was familiar with it. But Illustrator was WAY outside of my budget. It's taken me months to get a grip of the nodes etc. I would never have known after reading this, that you'd only been using it for a short time. You've mastered these things far quicker than I did.! Actually, I just got the program a few days ago. I haven't had a chance to really play with it. I was just so excited that I didn't have to constantly start over when I lost contact with the tool like in my old program. I'll be checking it out. Wow, I wish I had found it sooner. Glad to hear from another user! I love it too and most especially the price! Thanks! I absolutely love Inkscape. It takes a bit of getting used to but has so many features, the things you can do in that program! If I want to do something and I'm not sure how, I'll usually head over to the Youtube tutortials rather than the inkscape forums. I thought you explained this really will Ragtimelil. Wish I'd have found this page when I first downloaded inkscape. In my old program, if I released the mouse to scroll the image, I'd lose contact. Inkscape, and most drawing programs, keeps contact until you double click or join it to the end. Plus you can adjust it once it's done. I couldn't do that in my old program. My hand isn't very steady so this is much more forgiving for me. I don't have a "nodes and handles" thingy in my program. At least not that I have found! This is a good idea. I usually just trace the image with the pen tool, but I'll bet you get a more detailed image this way.